Sharp pain, aching or stiffness on the bottom of one or both heels is very common ailment. The pain is often at its worst upon wakening in the morning (or after sitting down for an extended period and then resuming activity), causing hobbling or limping for a few minutes before a comfortable stride can be resumed. As weight continues to be applied during walking or standing, mild or severe pain may persist. 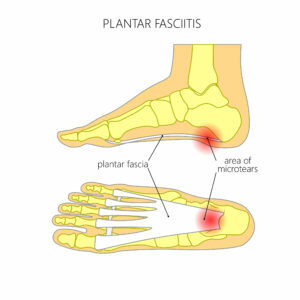 Heel pain originates within the foot, directly on the heel bone or within the foot’s connective tissue, called fascia. Several layers of fatty tissue surround the heel bone, softening the impact of walking and running and protecting the bones and muscles of the foot. Beneath this padding, a fibrous band of connective tissue (the fascia) extends from the heel bone, supports the arch and reaches across to the toes. Pain can result when these tissues become irritated or inflammed. Following an exam and assessment by Dr. Chaudhry a treatment plan can be put into place. Your treatment plan may include stretching exercises, cortisone injections, tapping, padding and possibly custom orthotics.